A twist of fate ends the serenity in rolling Pennsylvania hills. 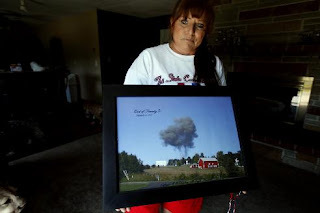 Val McClatchey, a real estate agent who lives about 1.6 miles from the Shanksville crash site, held a photo she took from her front porch 10 years ago. STOYSTOWN, PA. -- "Right here is where she went over," says Maluchnick, 55, a retired cop in Stoystown, population 385. "It was going so fast, all I caught was the tail. It was flying way too low and I told Ralph: If he doesn't elevate and get his nose up. ... Then we heard the boom and seen the smoke about three seconds later." McClatchey is president of the Keystone Camaro Club, so she usually has her Hewlett-Packard 315 point-and-shoot camera handy for car shows. It was sitting on her coffee table at 10:05 a.m. that morning 10 years ago, as she watched the "Today Show" at her house on Indian Lake, a filled-in strip mine. "Then I heard a surge of an engine and, man, was it loud," she says. The explosion a couple miles west nearly knocked her off the couch. She instinctively stepped out on the porch and took one shot of a massive plume of gray smoke filling the sky next to her neighbor's red barn. Then she dropped the camera and the battery fell out. Her photo instantly popped up in newspapers, websites and magazines around the world. She hired a lawyer to copyright her image, which she titled "End of Serenity." "Another blink of an eye and it would have hit the Shanksville school and all those kids would be gone," she says. "After a while, it gets overwhelming just to think about it." Ten years later, as grandchildren play in the driveway and an American flag flutters on her porch, McClatchey says she's had enough. She's trying to sell her acre on Indian Lake after 25 years. It's not going well. With the economy sputtering, McClatchey says the market "stinks." Her famous photo, which sells for $20 at a nearby general store, "has been a blessing and a cure," she says. Conspiracy theorists hound her on the Internet and even come to her door, claiming she faked the shot. She's burned through five lawyers, trying to protect her copyright. The FBI confiscated her camera immediately and she had to leap through all kinds of hoops to get it back. She keeps the memory card in a safe deposit box. This article confirms that Val's digital camera was an HP 315 that we had identified back in Oct '06. We also showed that this camera has four AA batteries, not one battery which this article and the Post-Gazette article before it implies it did when describing how Val supposedly dropped her camera after the single shot and the "battery" dislodged. Notice the article also says she usually had this camera handy for her car shows, which seems to suggest this camera wasn't that new, though it could mean she just had her new month-old camera handy for upcoming car shows. Note that the article says she burned through "five lawyers" trying to protect her copyright. Sounds expensive for someone who was supposedly donating all the proceeds from her photo to charity. It's also the first time we've heard that Val supposedly had trouble getting her confiscated camera's memory card back from the FBI.